Today we're talking about garbage and recycling. A lot of clutter in our homes is really garbage or recycling. It's not stuff we'll use again and it's not in good enough condition to donate or give away. 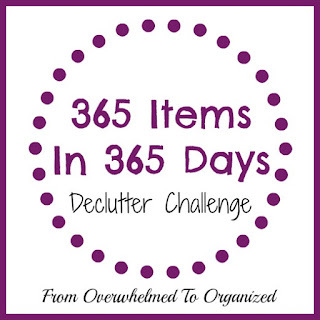 Before we start decluttering (that's starting tomorrow!! 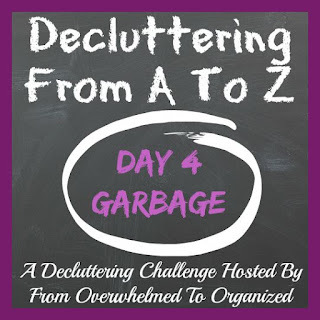 ), let's take a minute today and talk about how to deal with the garbage and recycling clutter we'll find this month. As you're decluttering this month, you'll want to donate or give away (or even sell if possible) as many items as you can to avoid sending usable items to the landfill. 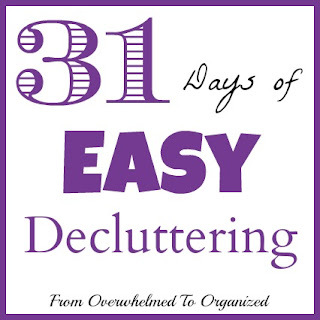 But for everything you're decluttering that isn't usable, toss it in the garbage or recycling. Just get it out of your home! I recommend using black garbage bags like these for garbage (the drawstrings make it really quick if you have lots of bags! ), and blue bags like these for recycling. Depending on what kind of trash you are eliminating, you may want to use odor shield bags so things don't get too smelly. Empty cardboard boxes work well for recycling too, especially if you're decluttering a lot of paper (it weighs more than other recycling so you can't fit as much in the blue bags). From my experience as a professional organizer, I can tell you that you get what you pay for with cheap bags. If you're filling a lot of bags it takes extra time to tie them with twist ties or knots. Note: make sure you know what the garbage and recycling rules are in your region. Some places only take garbage in cans or recycling in bins. If you know me or have been following me for awhile, you know I love Peter Walsh, and that he's one of the main reasons I became a professional organizer. One of my favourite tips from Peter is the "Trash Bag Tango". We already talked about donations yesterday, but I like Peter's idea of walking around and grabbing all the garbage you can find from the area you're trying to declutter. It really adds up and makes a big difference! Then once you've decluttered all the "easy" garbage and recycling, you'll be able to see better what clutter you're left with. That will make it easier to tackle it. I'd suggest modifying Peter's 2 bag system and have 1 bag for garbage and 1 bag for recycling. Gather all the garbage and recycling first, and then, as you go through everything else, you can decide if you want to donate, give away, sell, or keep it. If you're decluttering mail or other paperwork, you'll probably come across items you should shred. Anything with addresses, account numbers, or confidential information should be shredded instead of recycled. For small amounts, you can designate a bin or a box for shredding to go into, and when you're finished gathering it all, you can take a few minutes and shred it yourself. Light-duty shredder that sits on your own wastebasket - this kind works well if you only have occasional papers to shred. They're usually less expensive than the other types. And if you come across an extra garbage can in your decluttering you can use it! 6-sheet cross cut shredder - this kind works well if you shred a few papers a few times per week. 12-sheet high-security micro-cut shredder with pull-out bin - if you have a home office or shred a lot of highly confidential documents, this kind will be best. It's more expensive, but the pull-out bin makes it easy to empty and the 12-sheet capacity means you can shred more at one time. It also shreds your documents into much smaller pieces so it's more secure. I'm not recommending a specific brand here (I'll leave it to you to read reviews), but these links will give you some ideas of what kinds of shredders you can purchase. If you shred on a regular basis, you can usually keep on top of it yourself. But if you find you have a lot to shred all at once during this challenge, you may want to consider having it shredded somewhere else. Around here, a file box of papers is usually around $18-20 and that saves a TON of time shredding it yourself. It's also good to send your shredding away if you have limits on how many bags of shredded paper you can put out with your garbage or recycling. Some companies will even pick it up (for a little more cost) if you have enough. Check online for reviews to make sure you use a reputable company. Research your local waste management's rules for what items are acceptable in the garbage and what items can be recycled. Stock up on garbage and recycling bags (or whatever materials you need in your area) and keep them in an easily accessible area in your home. If you anticipate having some shredding during this challenge and you don't have a shredder, do some research and purchase one that best meets your needs. If you think you'll have a lot of paperwork to shred this month, research the costs and procedures for shredding companies in your area. If you want to jump in and declutter some trash or recycling, grab a couple of bags and get started! How much of the clutter in your home is actually garbage or materials to recycle? Have you ever tried the "Trash Bag Tango"? What tips can you share for preventing garbage or recycling from cluttering up your home?